On Philadelphia Songs, Denison Witmer paints a haunting and beautiful picture of memories, people, and places. The album features a host of guest musicians and Philadelphians. as well as members of The Six Parts Seven (Suicide Squeeze Records). Philadelphia Songs, his third full-length, was recorded in Philadelphia at home by friend Scott French and at Soundgun studios by Edan Cohen (Songs:Ohia, Jim & Jenny & the Pinetops). The instrumentation is rich and deep, adding an ambient feel to Witmer’s songs that has not been fully explored until this album. From the nostalgic romanticism of Sets of Keys to the heartbreaking 24 turned 25 to the MiniDisc hotel piano field recording on St. Cecilia (Ode to Music), the words and sounds form a tapestry that reflects Philadelphia from Denison’s point of view. 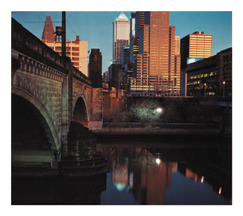 Aside from being recorded in Philadelphia, Philadelphia Songs includes extensive photography from various city locations picked by Witmer and vividly captured on film by Philadelphia photographer Brady Sanders.